The No.1 Home for the Aged, Pudong New District presented a silk banner, Morals prevail the care and respect, love and serve the aged, for Zenith recently to appreciate the great support and help offered by Zenith for the public interests cause. 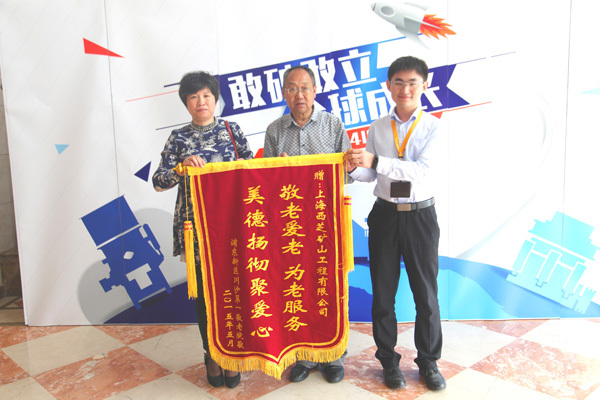 Mr. Zhang Xiaolong, manager of Zenith, and Mr, Zhang Tiancai, secretary of Party Branch, warmly took the silk banner. It’s known that 22 volunteers from Zenith, in virtue of Mother’s Day, looked after the aged in No. 1 Home for the Aged with daily necessities, foods and well-prepared performances, chatted and brought enjoyment to them. Ms. Yao, the director of No.1 Home for the Aged, visited Zenith and presented the silk banner. Ms. Yao also noted at the conference that the care offered by Zenith not only affected me, also each person living there. Zenith is giving desired spiritual foods for aged, so you deserve the silk banner. She was also deeply moved by the constant public interests and help on the aged given by Zenith. Moreover, she also expects to pass the love and care by Medias and advocate the whole society to care for them. Mr. Zhang, the manager of Zenith, noted it is a traditional moral to respect and love the aged in China. It is very significant for Zenith to try to help the aged and bring them enjoyment. Zenith is bound to continue performing the responsibilities as an enterprise and society, seriously treat the public interests, and pass this spirit to each employee in Zenith.